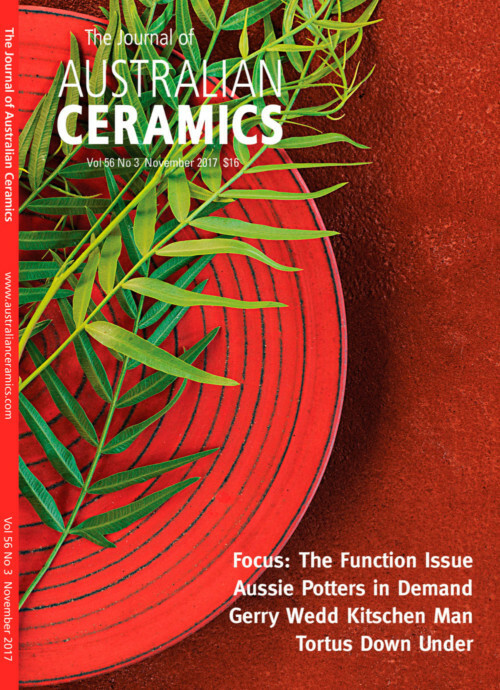 Our April issue of The Journal of Australian Ceramics is full to the brim with articles on ceramicists who will be presenting, demonstrating and exhibiting at The Australian Ceramics Triennale 2019 – Sergei Isupov, Elisa Helland-Hansen, Glenn Barkley, Fleur Schell, David Ray, Anna-Marie Wallace and Prue Venables to name just a few. 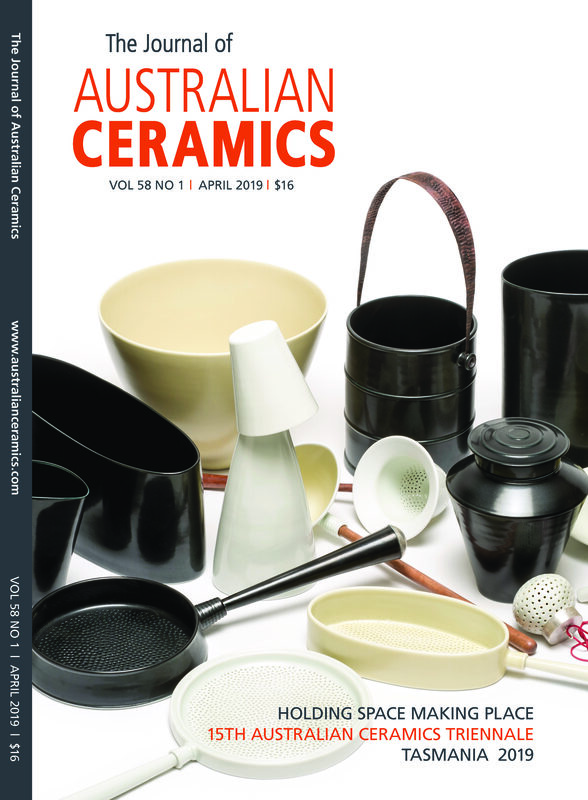 A 32-page MANIFEST catalogue is also part of this bumper 160-page issue. 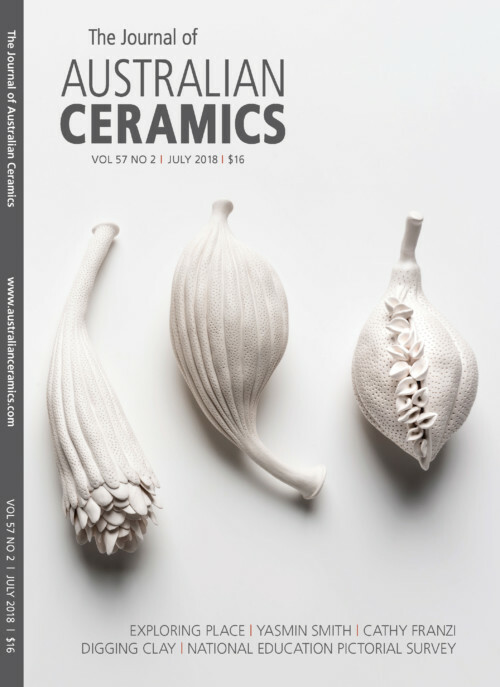 581 artists: Andres Allik, Connie Augoustinos, Jane Bamford, Andrea Barker, Glenn Barkley, Julie Bartholomew, Nanna Bayer, Boxplot, Lisa Britzman, Lisa Cahill, Alison Milyka Carroll, Somchai Charoen, Ian Clare, Kris Coad, Rebecca Coates, Greg Daly, Andrei Davidoff, Zsolt Faludi, Honor Freeman, Shannon Garson, Ebony Heidenreich, Elisa Helland-Hansen, Anne Mette Hjortshøj, Neil Hoffmann, Sergei Isupov, Claire Johnson, Nicolette Johnson, Amy Kennedy, Shane Kent, Dr Sandy Lockwood, Gerald Makin, Jeff Malpas, Heidi McKenzie, Damon Moon, Annemieke Mulders, Bridget Nicholson, NOT, Anna O’Loughlin, Marine Ostinato, Andrew Parker, Alicja Patanowska, David Ray, Serena Rosevear, Dr Owen Rye, Fleur Schell, Hamada Shoji, Susan Simonini, Zoë Slee, Jimmy Kenny Thaiday, Dee Taylor-Graham, Peter Timms, Kenji Uranishi, Dawn Vachon, Prue Venables, Anna-Marie Wallace, Sallee Warner, Steve Williams and Alana Wilson.